In early November, 5 of us took the long trip up to Chiang Mai Province, spending a couple of days to the East of the City near Doi Mot and then travelling further north to stay in the mountains at Doi Ang Kang (1900m), which was very beautiful. The first part went well, but we had forgotten that in the mountains, up north, it gets rather cold, 8C (this is what comes when you live in a place where the coldest night time temperature is a freezing 25C! I had not needed socks, long trousers or sweaters for 7 years.) 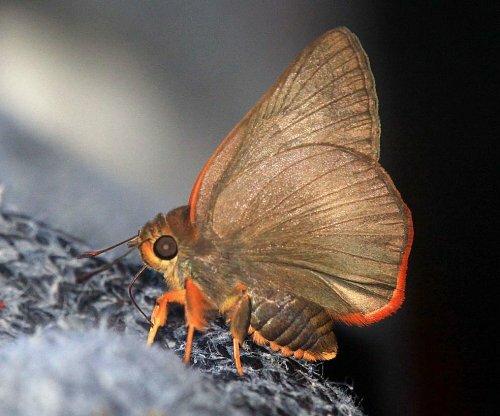 and there were few butterflies at altitude at the time. 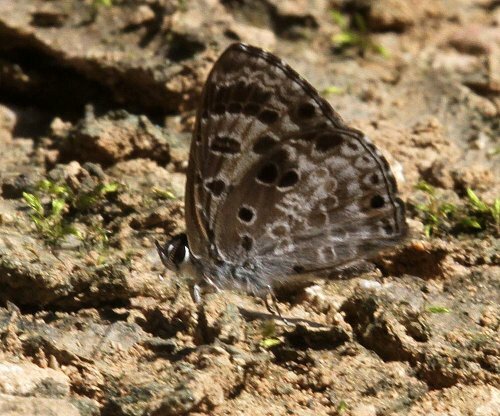 Accordingly, we spent most of our time at the bottom of the mountain at Chiang Dao Wildlife Sanctuary, which was brilliant. 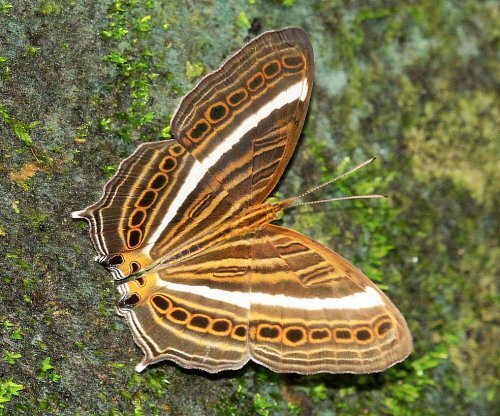 DOI MOT – This area does not reach the altitudes were to find later on, but we did come across some interesting species. 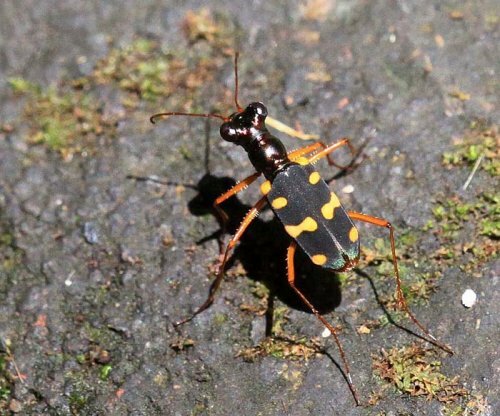 The highlight here, for me, was Delias acalas pyramus. 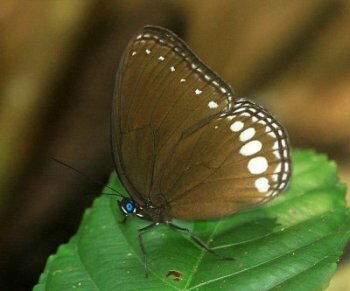 The subspecies is only found in the northern part of Thailand. 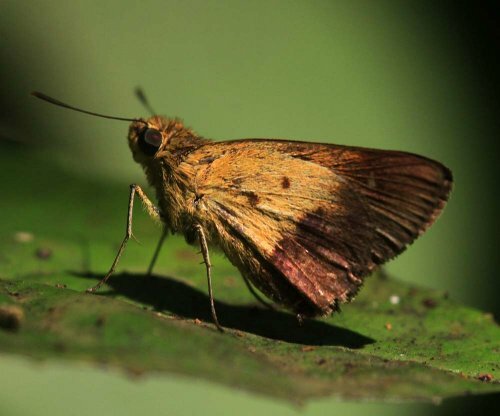 The other real find was the very rare skipper, the Nonsuch Palmer (Creteus cyrina cyrina). 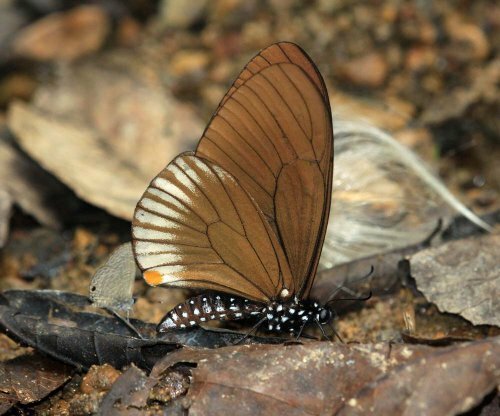 DOI ANG KANG – This is where we stayed, in the mountains, and, as previously mentioned was poor in butterflies, no doubt owing to the time of year we visited. 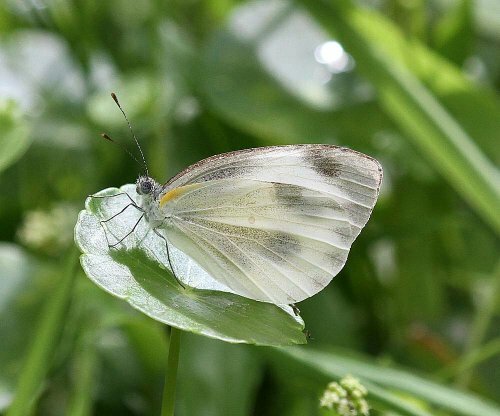 Nevertheless, there were a couple of new species for me, including the local subspecies of a species I had come across commonly when living in the UK, the Green-Veined White, Pieris napi montana. 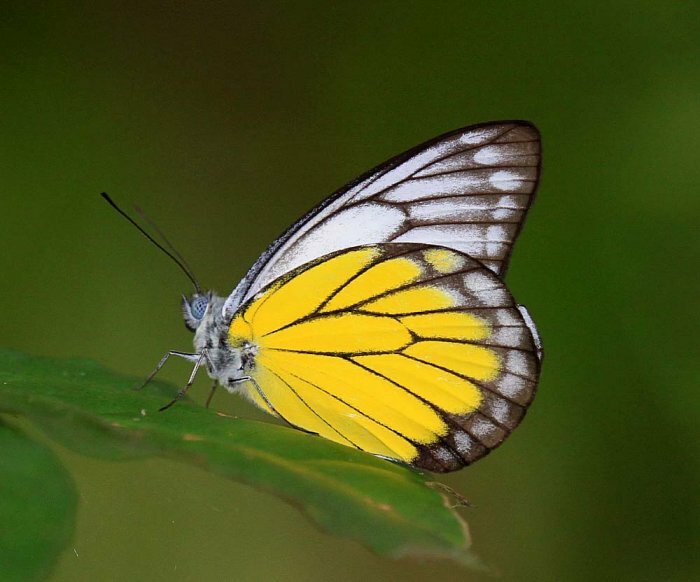 Another Pierid we saw was the Indian Cabbage White (Artogeia canidia canidia). 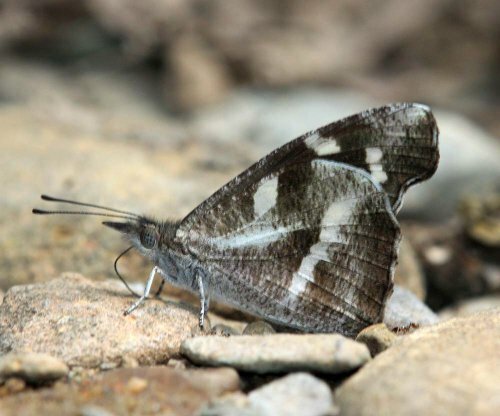 The other interesting species for me there was the very aptly named Dull Forrester (Lethe gulnihal peguana). 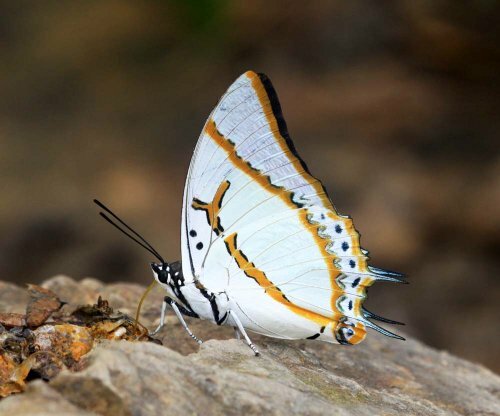 CHIANG DAO WILDERNERSS SANCTUARY – This was, by far, the most productive area we visited. 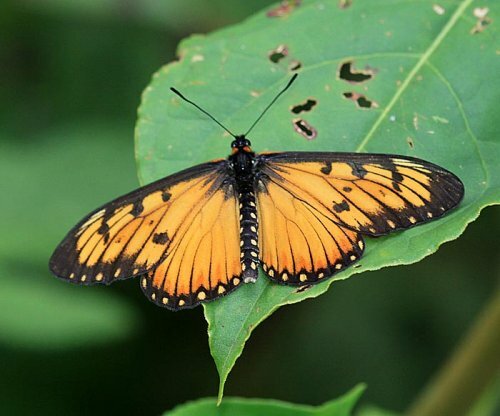 Many new species were seen, and it was not the best season. I am travelling there again at the end of February. 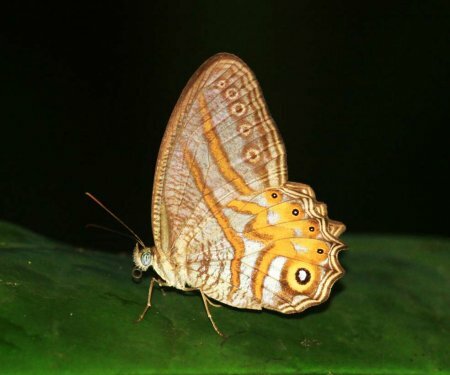 Just some of the species found can be seen below. In late September, I took my first trip to the north of Thailand, visiting both National Parks in both Phitsanulok and Petchabun Provinces. 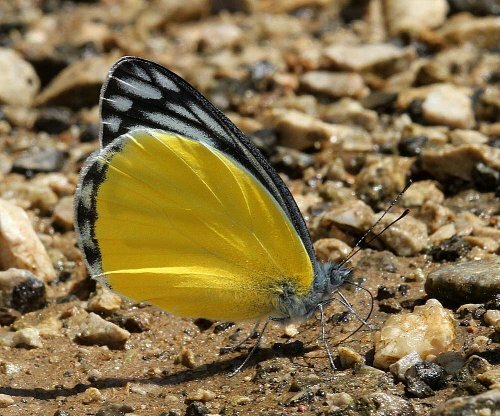 The first two days were spent in company with some friends from the SaveButterfly website, and they proved excellent hosts, knowing the Thung Salaeng Luang National Park (which approximately means Large Savanah) well. With our friends help, we were able to see many species not found in the south of the Country, which has been my hunting ground up to now. Just a few of them can be seen below. 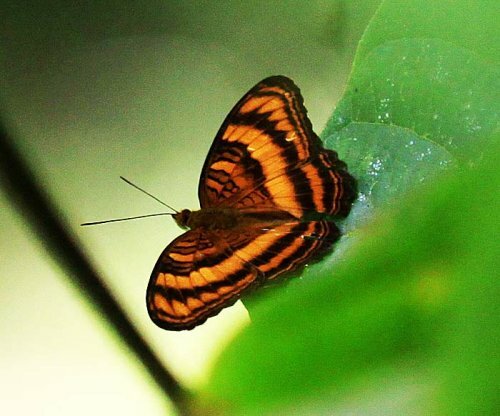 On the third day, after saying goodbye to our friends who had to return to Bangkok, we headed off to Tad Mok National Park in Petchabun Province. 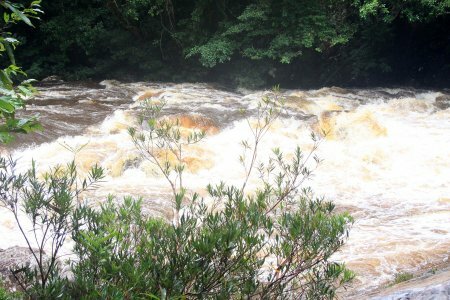 Unfortunately, after heavy rains, we were not allowed to walk along the path to the waterfall. 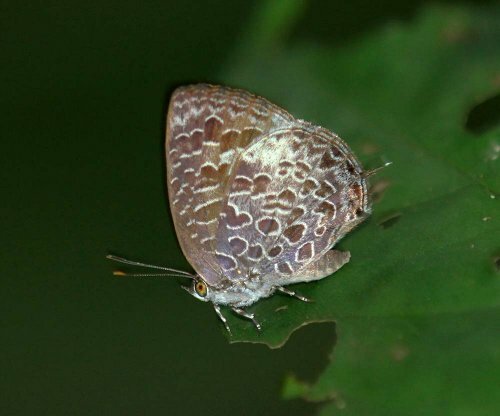 Nevertheless, there were still different, more forest orientated species, the area being particlarly rich in Athyma species. 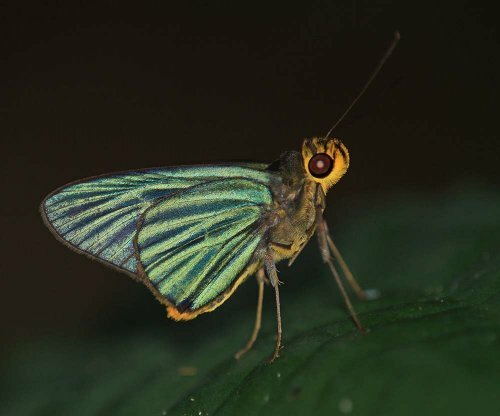 Athyma species. 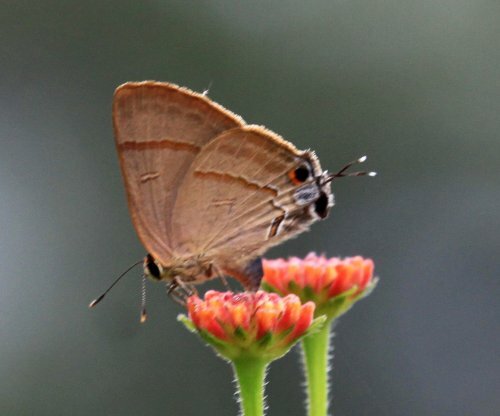 Exact species is a matter of current debate. 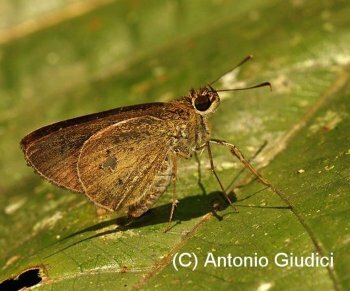 I believe that this is an undescribed subspecies of Athyma cama. Our final day was to be spent at Phu Hin Rongkla National Park, our first venture into the montane area of Phitsanulok Province. The entrance to the park is at approximately 1650 metres, and climbs up to a maximum if 1800 metres. The road is heavily pockmarked which makes driving uncomfortable, particularly when driving through very heavy rain, which, unfortunatley we had to do. The heavens opened shortly after our arrival on the mountain, but we still were able to see a few species. 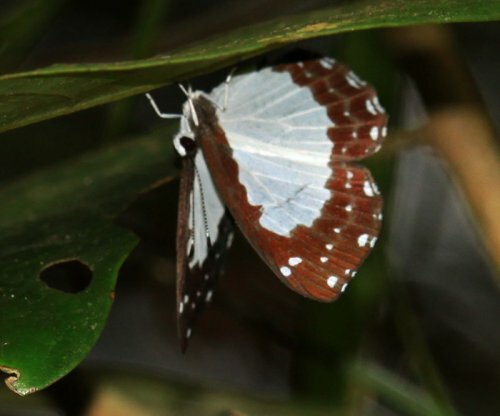 This was a lovely area at the edge of the main central rice plain of Thailand, and we hope to go back in April/May time, when we have been told that it should be possible to find a species of JungleQueen (Stichophthalma sp. 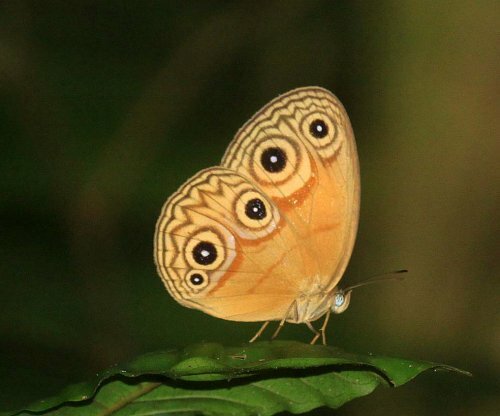 ), a species that is at the top of my ‘Want to See’ list. 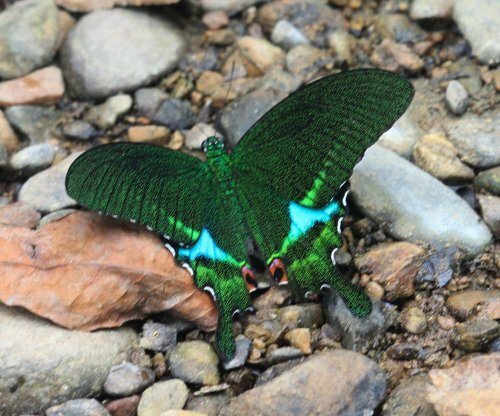 In July 2013, I made my second visit to Danum Valley, a well known Reserve in the Malaysian Province of Sabah. I had previously visited the place in 2010, and that had been a very successful and enjoyable one, so I was really looking forward to visiting the area again. As before, our group stayed at the Scientists Research Centre, which is on the opposite side of the reserve to the exclusive tourist hotel. The accomodation is more than satisfactory, and the presence of researchers there, who are always happy to give their expertise, is an added bonus. 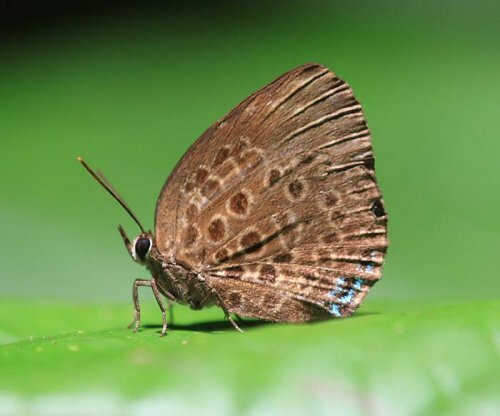 Unfortunately, Borneo appears to be suffering from the same butterfly drought as Peninsular Thailand and Malaysia, and numbers seen were less than during my previous visit. However, we did see enough to keep ouselves pleasantly occupied throughout our visit. 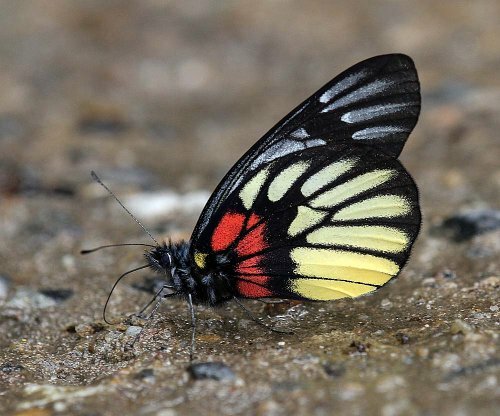 Our first butterfly was one that allowed me to correct an omission from my previous trips to Sabah, we came across a reasonably willing model of the nominate form of Rajah Brooke’s Birdwing, Trogonoptera brookiana brookiana. However, even though this species regularly rested, it was always several metres up, so the angle of shot is not a good as I would have hoped. 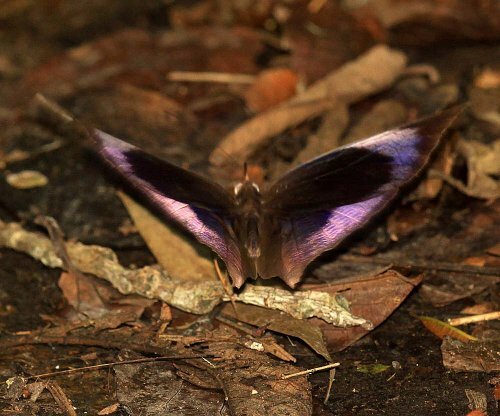 Flying around the same tree was a new species for me, Atrophaneura nox noctis (Blue Batwing), a female, which is considerbly larger than the male. 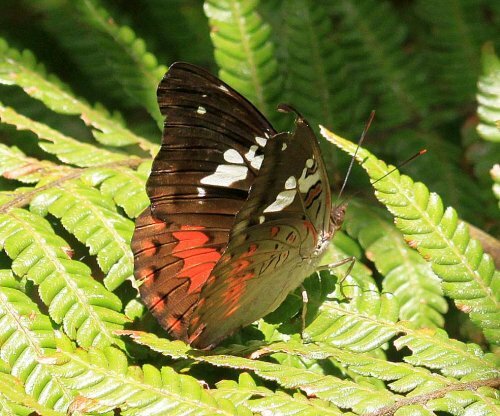 There are a large number of forest trails to walk along, and last time they had proved to be a wealth of species. This time, however, they were rather disappointing. 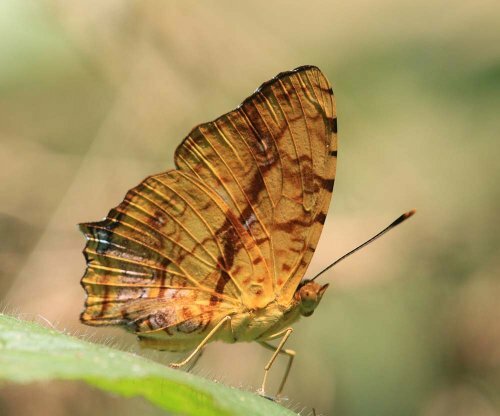 With a paucity of butterflies, two of us went searching for Dragonflies, and in this we were not disappointed, finding many species, some of which are still to be described scientifically. 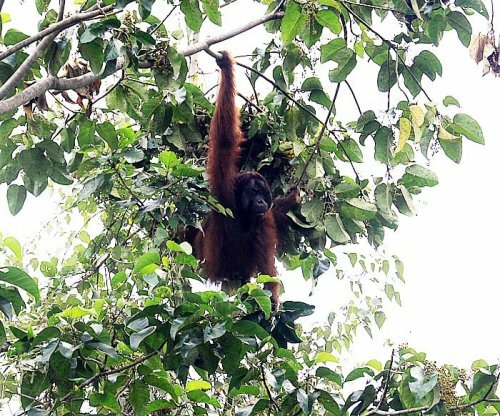 Unlike Maliau Basin, larger animals can be found here, and we were lucky that several wild Orang-Utans were present this time. These are not rescued individuals released back into the wild, but truly wild ones. 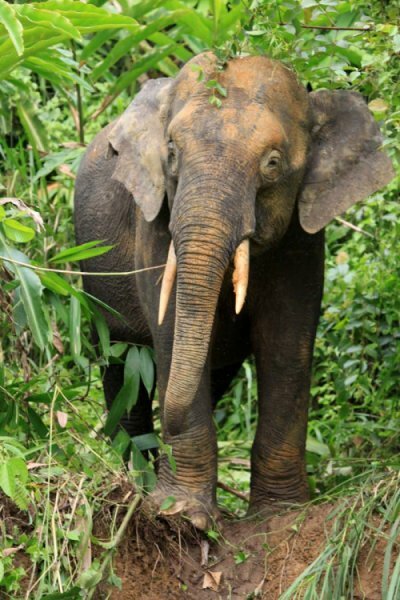 Also, pygmy elephants were also in the area, but not in the same numbers as seen previously, they were elsewhere. This is a highly endangered subspecies of the Asian Elephant, which some scientists consider may be a seperate species entirely. We came across other fauna, and overall, had a great time in a truly beautiful area. I strongly recommend a stay at the Centre, the rooms are comfortable and the food is good, and you do not have to ‘rough it’! 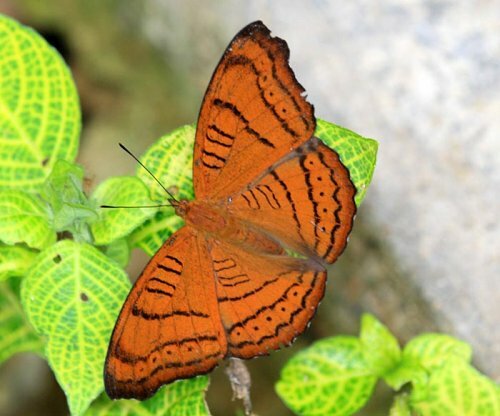 In May this year, I was asked to visit Koh Taen, a private island some 4 kilometres off the south-western part of Koh Samui to understake a butterfly survey for the owner who is keen to preserve the island’s natural resources. This small island (only 7 sq. 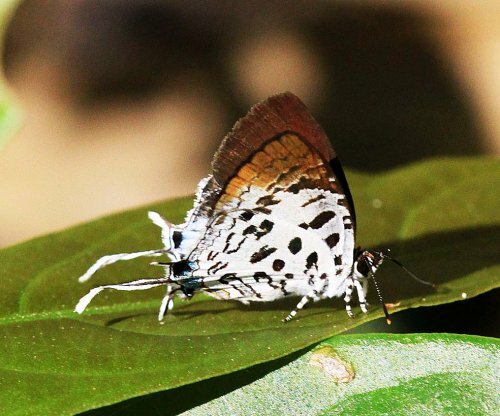 Km) is, unlike Samui, undeveloped, so I hoped to find some species there which I had not seen on Samui for several years. This proved to be the case. 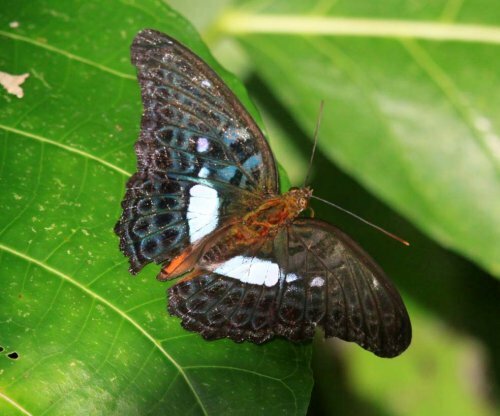 The habitat consists of secondary forest, the island having, many years ago been extensively logged, and is only now recovering, together with a large area of mangrove, which is much larger than that on Samui. 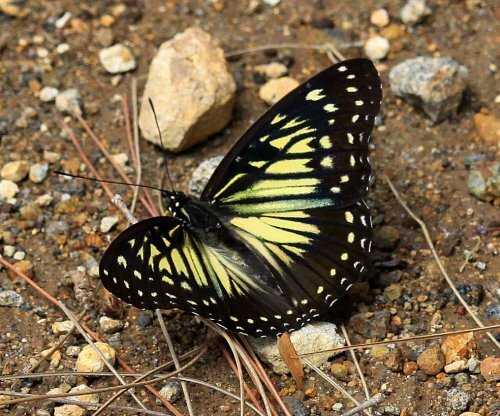 This area, however, proved disappointing, butterfly-wise. There is also a small area of grassland near the one area given over to chalets and a restaurant. In total I found 94 species in the 3 days I spent there, just below the 100 I had promised an unbeliving owner who was expecting 40-50! However, I know fully well that I missed several, and also that 3 days in May is not enough time for a full survey. 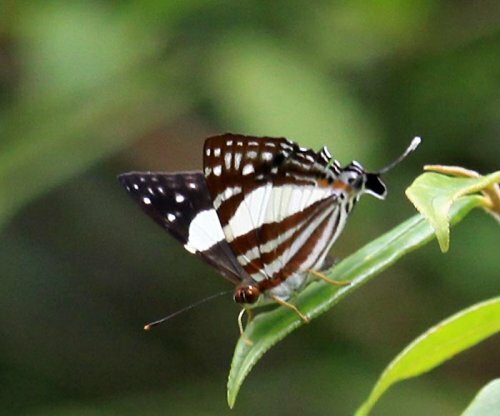 The first of the rarer species I found was The Lesser Zebra (Graphium macareus perakensis) which had not been seen on Samui since 2010. 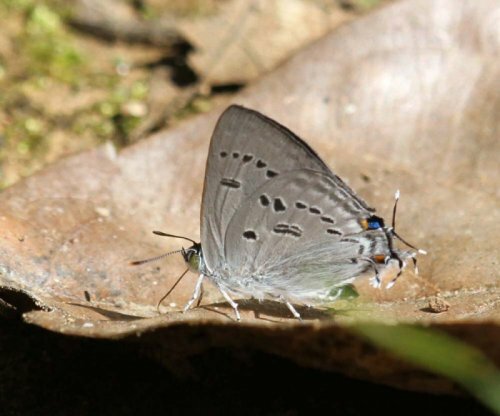 Almost immediately after, I had a huge shock when I came across a species not seen on Samui at all, one I had only previously seen in Khao Sok National Park, this being the Blue Posy (Drupadia scaeva scaeva). 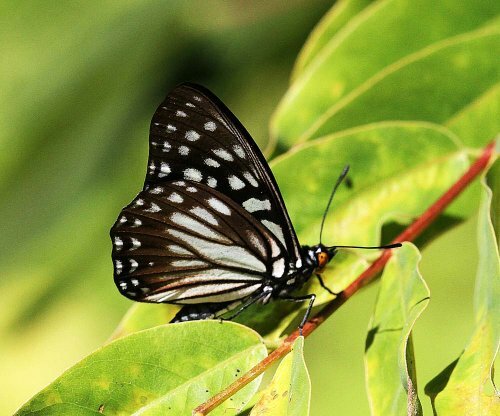 Euploea species were in abundance on the island, much more than on Samui, and nearly all of the known Samui species were to be found on a single flowering tree on the edge of woodland. 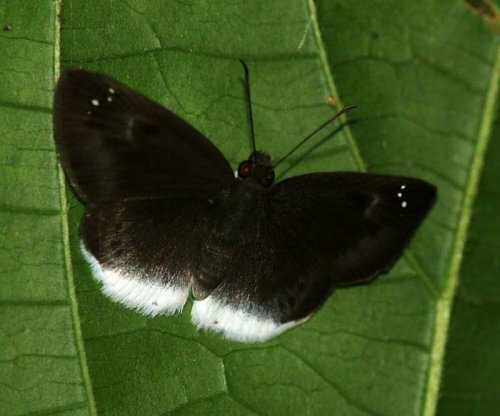 Also Hasora species where much more in evidence than on the mainland. 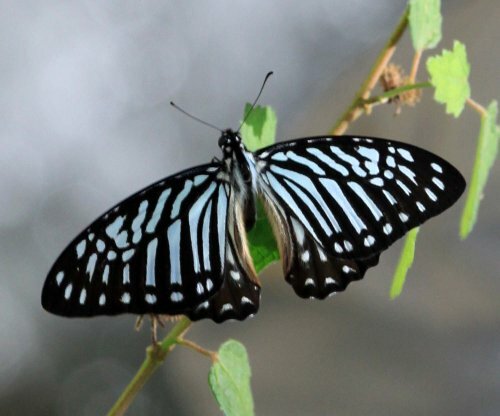 My last morning on the island provided a wonderful farewell present, my first Stripe Swordtail (Graphium aristeus hermocrates) since 2008. This was a very pleasant break from the noise and hurly-burly of Samui, and, although I do not normally endorse businesses on this site, the trip would not have been possible without the permission and help of Andre Russell, of Island Hoppers (info@samui-discounts.com), who arranged my entire trip and accomodation on the island. They also do 1 day snorkelling trips round the island, with lunch at the island restaurant. 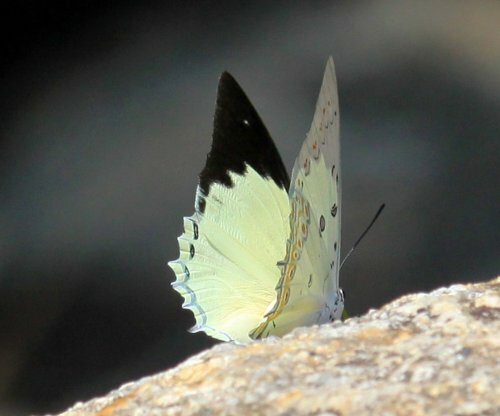 This year has been very dry on Samui, and the numbers of butterflies here have been exceptionally low, one could say boring! Accordingly I have been popping over, several times, to the mainland in the hope that things were better there. I have been concentrating on the Province south of Surat Thani, where I live. 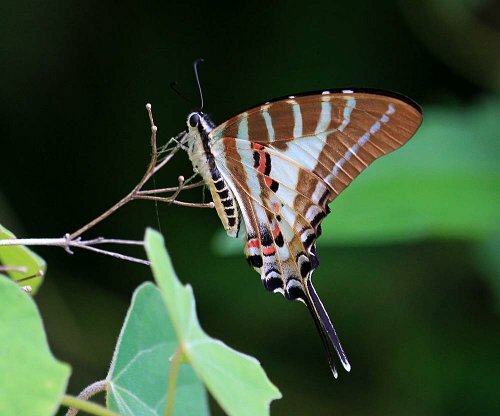 Nakhon Si Thammarat Province has a diverse range of habitats, from lowland plains, near the coast and to the south-west of the province, to central mountain ranges, which includes Khao Luang which, at 1835m. in height, is the highest point in Thailand south of Bangkok. 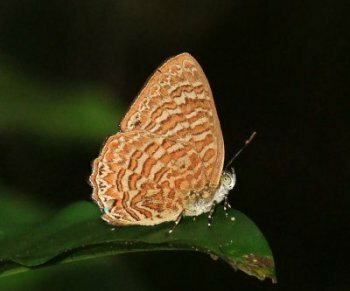 It has been in these central mountains and their foothills where I have concentrated my searches, as it is there where one can find the best rainforests. I have not been disappointed! 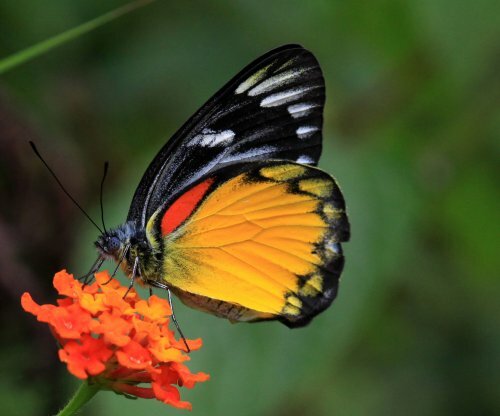 The star of the show was this Delias singhapura singhapura (Lion Jezebel). 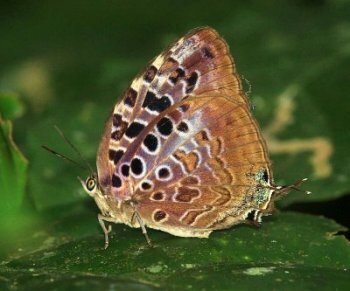 This is one of the rarest species in Thailand, and the subspecies can only be found in Southern Thailand and in West Malaysia, where it is equally rare. Owing to this, I can not, unfortunately, reveal the exact location of the finding. We found a small colony, which I had not found during my previous visits to the location a few years back. 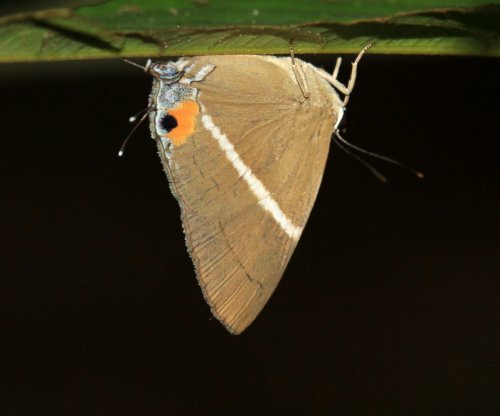 However, they were breeding, as can be seen in the photo of the female, who, with her abdomen raised, is saying that she had already mated, and therefore did not want to be bothered with a male that was fluttering, hopefully, close by. I will be keeping a close watch on this colony in the future in the hope that it may expand in size, and also be found in other locations nearby. 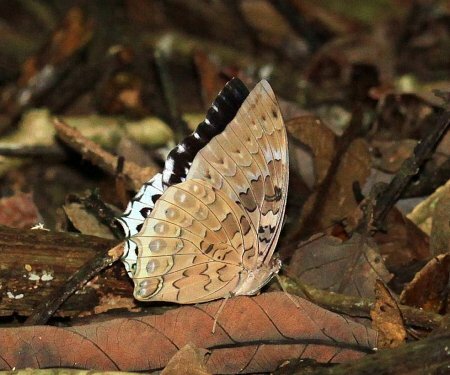 Locations we visited where I can reveal which species we found include Karom Waterfall. 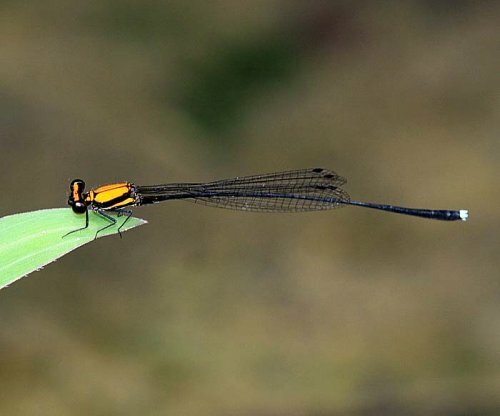 There is a quite short nature trail there, and below are a couple of the species we saw there. 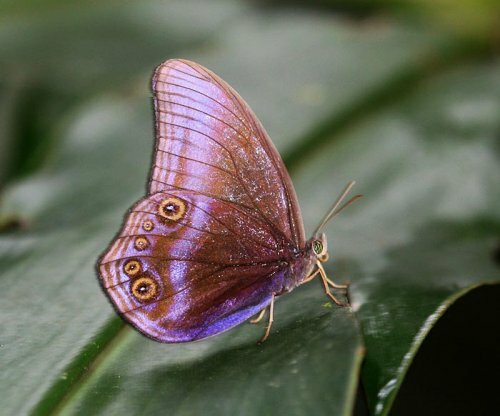 Arhopala ariel. A rare species of the ganesa subgroup of this huge genus. 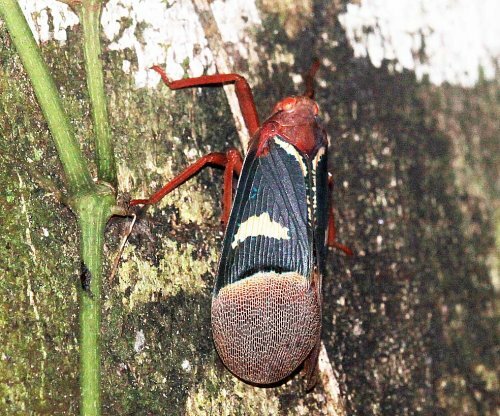 Choaspes stigmatus caudatus. A late afternoon species. Deramas livens evansi. 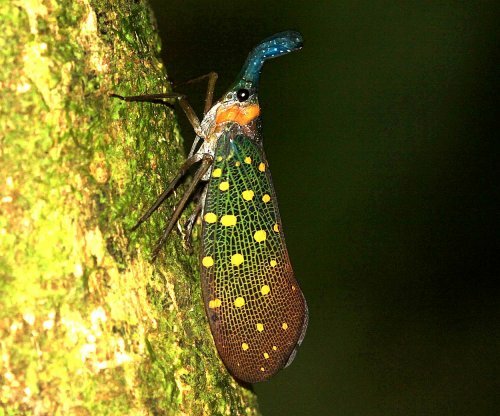 All members of this genus are very rare. 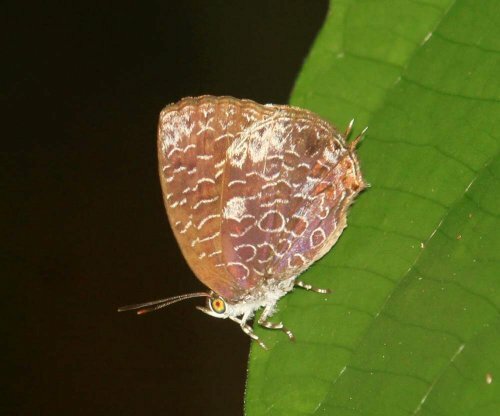 Arhopala ammonides ammonides. Another member of the ganesa subgroup, but with an additional costal white spot. 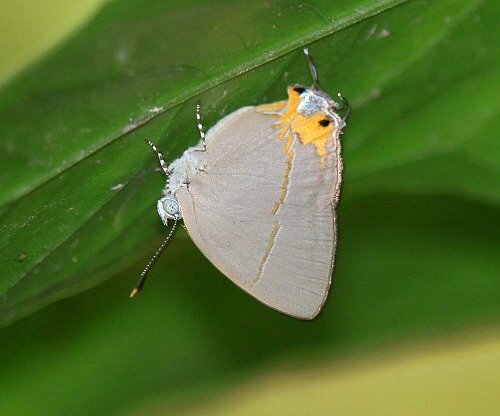 Kallima limborgi. 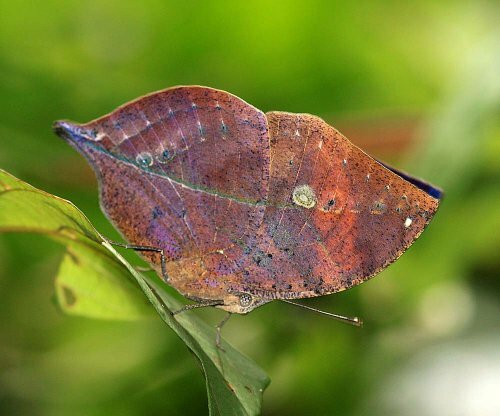 The famous Leaf Butterfly, a species I had always wanted to find. 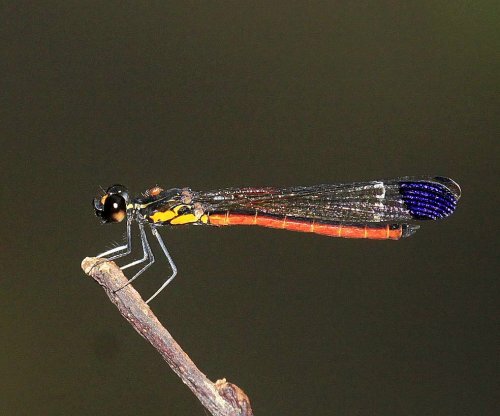 Zeuxidia doubledayi doubledayi – male. 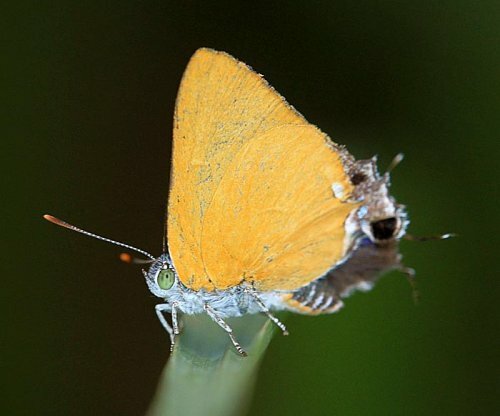 A rare upperside shot. 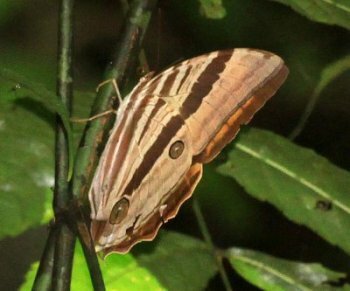 Isma bononoides. 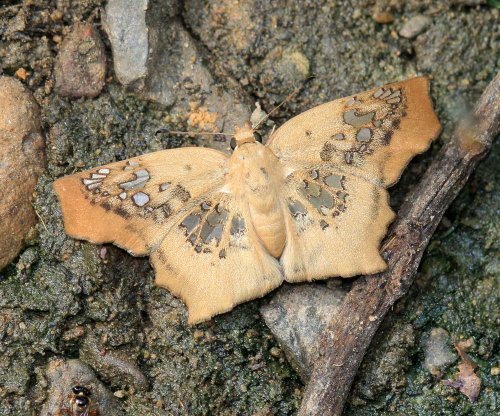 A very rare species distinguished by having the hyaline spots yellowish. Yong Waterfall National Park was the southernmost area I visited. 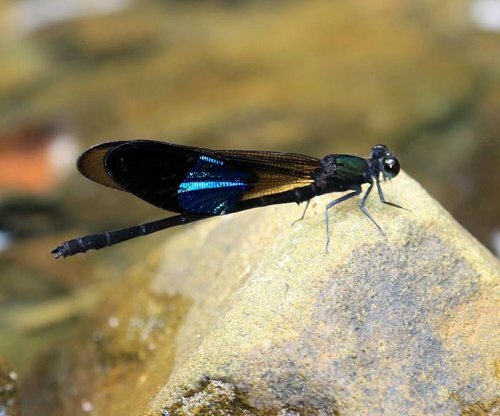 Again, there is a short nature trail away from the main waterfall which is very popular with locals, and, once more, I came across some new species to me. These are just three of the places we visited on our trips, and there are many more locations that can be investigated in this varied and beautful province, a large part of which, I am pleased to say, is made up of protected areas. 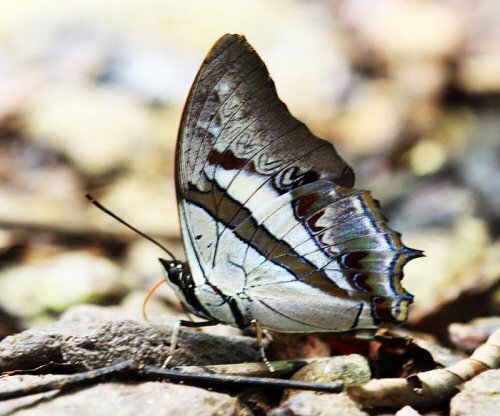 In early March, 5 members of the Butterfly Circle went up to Kaeng Krachan NP, in Petchaburi Province, Thailand, for a short visit. 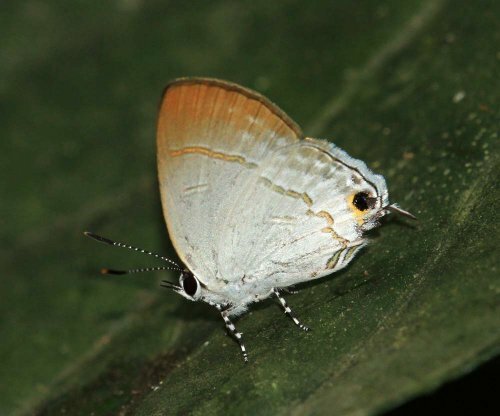 This is an interesting location as it is situated just north of the supposed divide between the Sundaland fauna (South), and Indo-Burmese fauna (North). 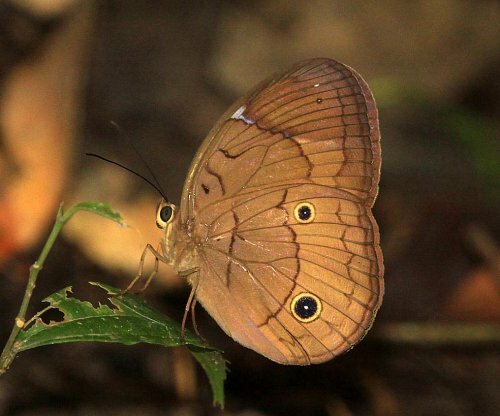 I was therefore hopeful that I would come across a few species not seen on or near my Samui home. I was not disappointed. 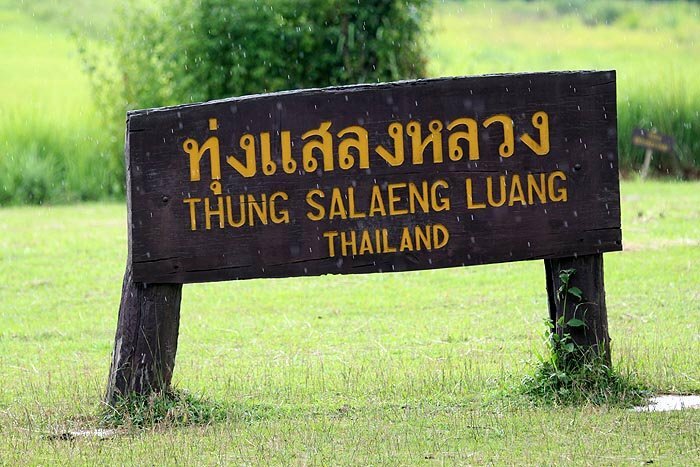 The park is the third largest in Thailand, situated on the southern border of Thailand and Myanmar (Burma), and home to many of the larger mammals of Thailand. We stayed at a small resort just outside the Park boundary, and it is used primarily by bird-watchers, as this park is a well-known mecca for this activity. The park office is about 15Km inside the boundary, and the road to it starts of paved, but halfway along reverts to the more normal dirt track. At the office, there is also a restaurant, and camping facilities. To travel further, there are strict times when vehicles are allowed either up or down. This is because after 3Km. the road is single track, very steep in places and with no passing areas. Only 4-wheel drive vehicles are allowed after the 3km point. As a group, we did not venture past that point, but before my friends from Singapore and Malaysia arrived, Antonio and I did venture up to the top of the mountain (1035m). 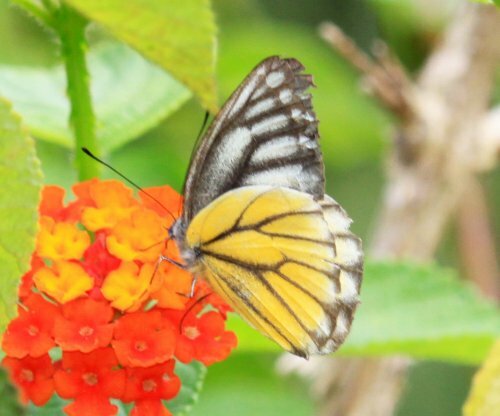 It gave very pretty views, but was not rewarding, butterfly-wise. 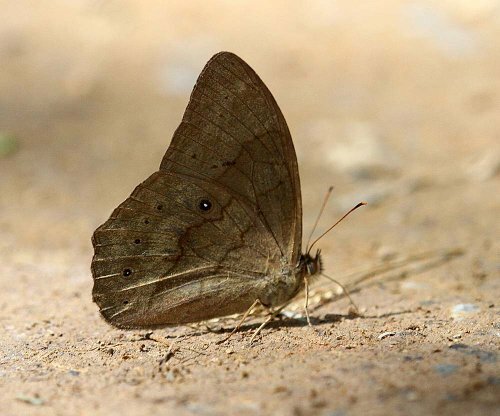 The best areas for butterflies were 3 areas where the road from the office to the 3Km. point were crossed by small streams. 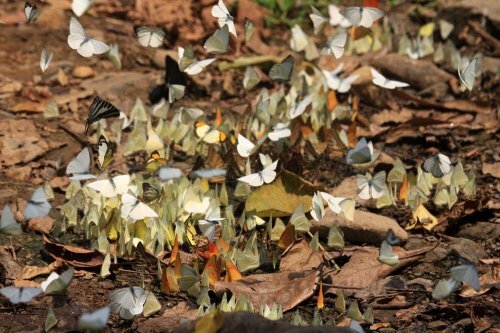 I have never seen so many puddling butterflies in such a small area in my life. It certainly never seems to happen further south on the peninsular. The pictures below can only give a poor idea of the true numbers seen at these locations at any one time. 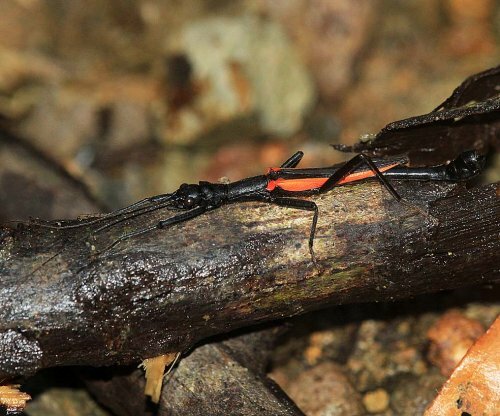 These huge conglomerations made it difficult to isolate single specimens to get decent photos, but we still managed it to our satisfaction, though some species seen were never co-operative. 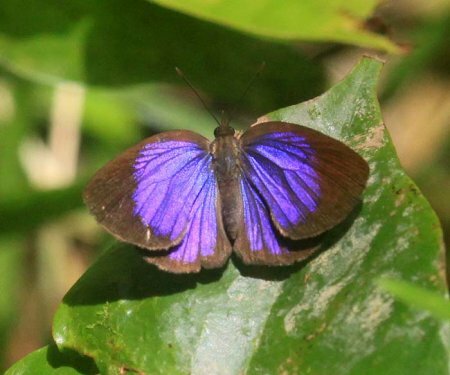 In fact, there were so many that I missed several species which, although previously photographed by me were of a different subspecies, which I had not come across before. 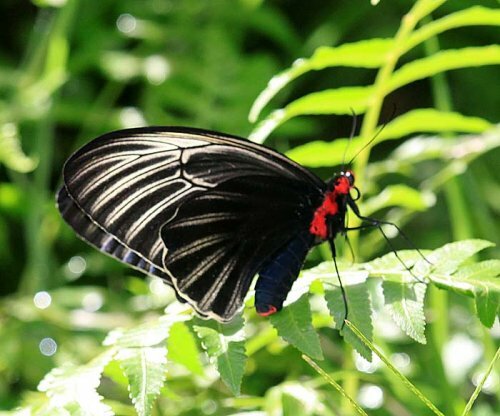 There was one species which I had dismissed for the first couple of days as Papilio memnon, common on Samui, and so had ignored it. 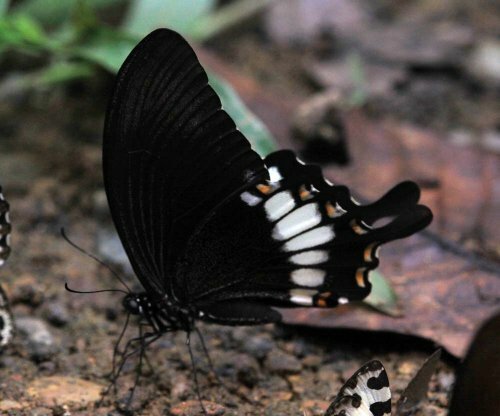 Only on the third day did I discover that the undersides were different and it was a new species for me, The Spangle (Papilio protenor euprotenor). 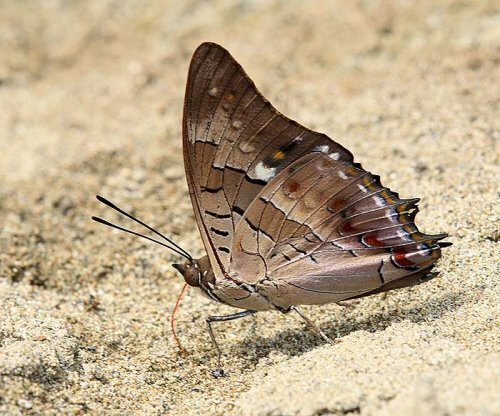 One of our main objectives had been to photograph the Great Nawab (Charaxes (Polyura) eudamippus eudamippus), and a few happily turned up. 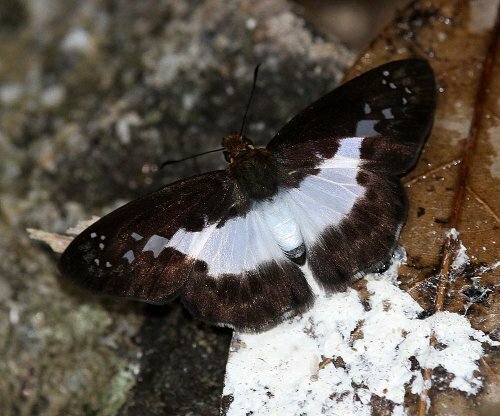 This species is one of many that we saw that are at close to the southernmost part of their range. 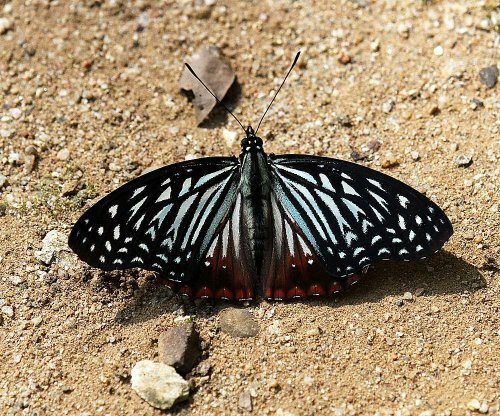 Another of the species, which only appeared on the first day, so Ellen, Nelson and LC all missed it, was this Blue-striped Mime (Papilio slateri slateri). 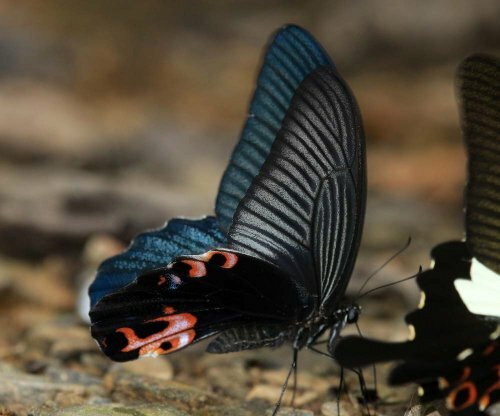 A true jewel of the forest is the Paris Peacock (Papilio paris paris), which was seen on most days, it is stunning! It is also not found further south. 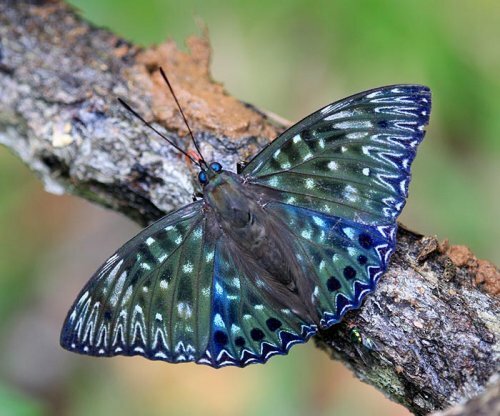 I had hoped that I might find a species, the Blue Helen (Papilio prexaspes andamanicus) known once from Samui, but for which I am still lacking a photo. 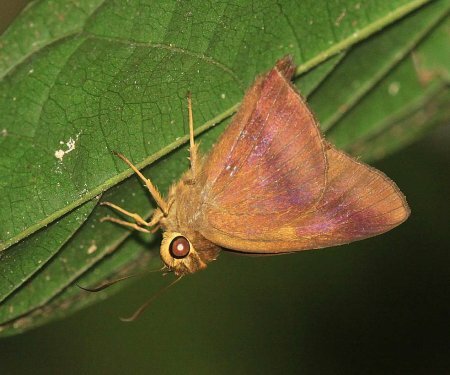 The species was there, but it was the wrong subspecies, P. prexaspes pitmani, which immediately told me that I would not find my goal here as two subspecies can not live in the same area. 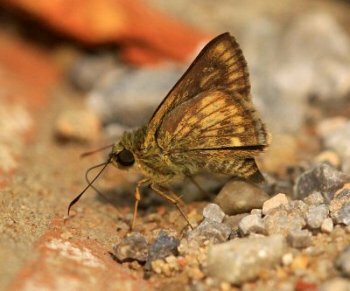 Below are other species found in the open, near the road, which were new to me. As far as I can see, some of these photos may increase the known range of the species southwards. 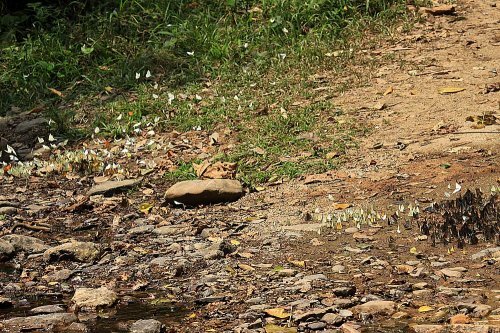 There are a few short trails off the main ‘road’, and these produced different species, which prefer to stay in the undergrowth. 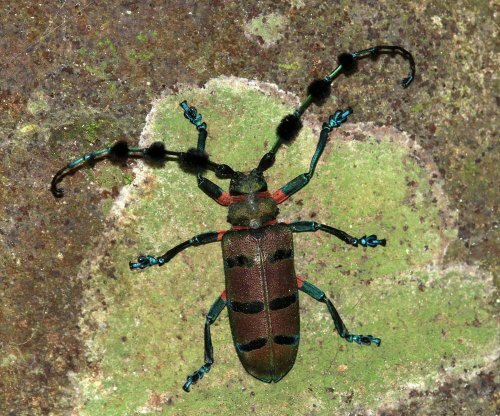 Because of the overwhelming number of butterflies around, I spent little time looking for other forms of insects, but we did come across this particularly beautiful Long-horn Beetle. 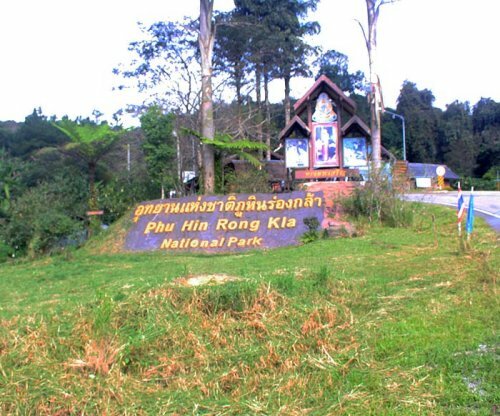 This National Park is a wonderful place to visit at any time of the year, though the road up to the mountain is closed during the rainy season for safety reasons. However, it is very remote, the nearest petrol stations and ATMs are about 30Km. away and credit cards are not universally accepted! Be warned. 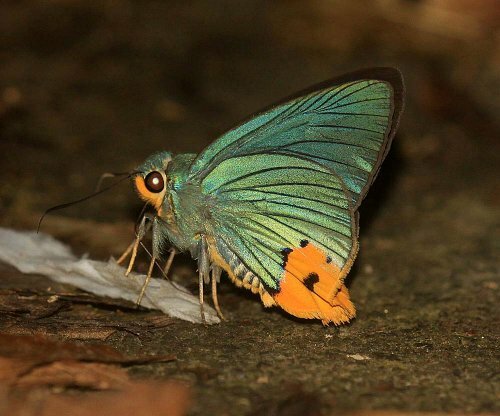 For all the species and subspecies new to me from this trip, please go the ‘Expeditions’ section and click on Thailand-Mainland. I spent a long week-end at Fraser’ Hill (FH), in Malaysia, with friends from Kuala Lumpur and Singapore. 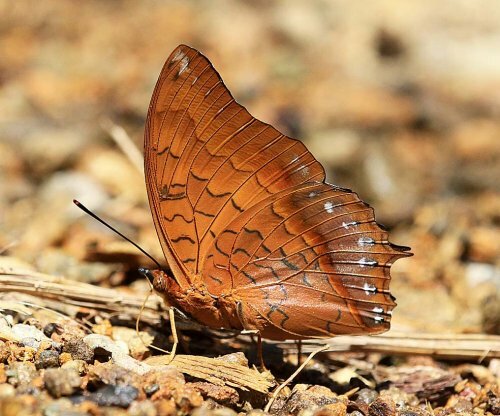 Fraser’s Hill is famous as a bird watcher’s paradise, though it was originally built as a hill station by British colonialists in the early 1900’s, as a cooling summer retreat from the hot and humid towns in the lowlands. It stands at approximately 1500m above sea level. As its name suggests, the terrain is generally very hilly, making treking in the area quite arduous. Both on the way there, and back, we stopped at a small riverbank near the reservoir at Chilling. 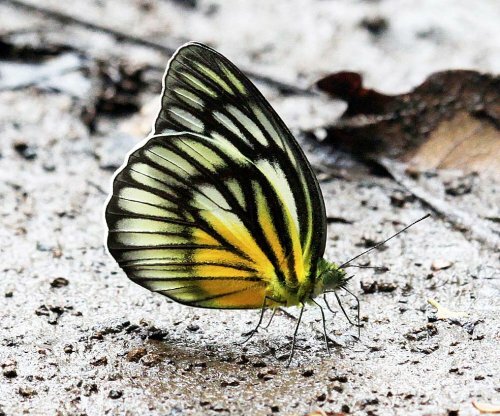 Puddling butterflies were plentiful, and if I ever see another Chocolate Albatross (Appias lyncida), I will scream, they were everywhere, disturbing shots I wanted to take of other species. 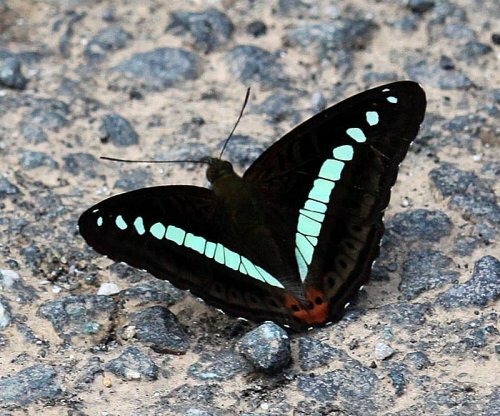 Despite their constant intrusions, I was delighted to get an upperwing shot of the Jewel Nawab (Polyura delphis concha), as I already had underside shots of that species. 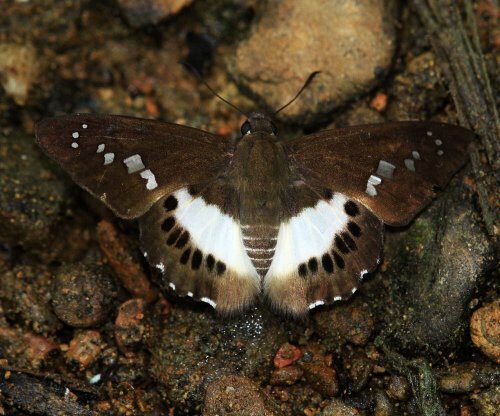 One rarity I came across there was Amathusia perakana perakana. This is very much like the very common PalmKing, which can be found anywhere there are coconuts, and its identification was only confirmed after my return home. 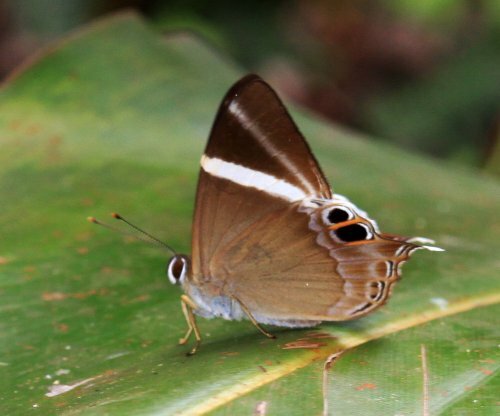 Owing to the altitude of FH, I was hopeful of seeing some of the more montane species to be found in Malaysia, especially some Delias. 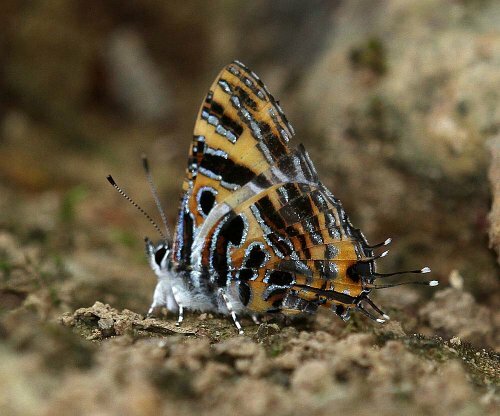 I was not disappointed getting three Delias species into my camera, together with a few other montane species which were new to me. 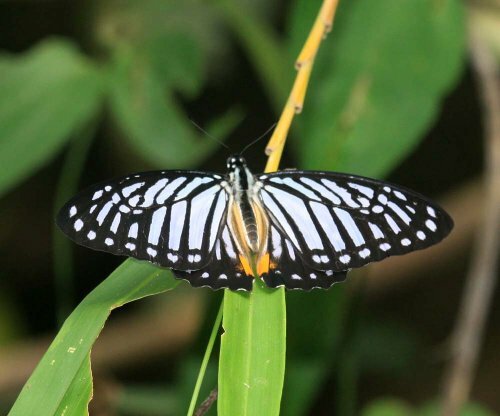 On the way back, after the Chilling stop, we also stopped at Sungei Tua Nature Reserve, and found a couple of interesting species, but only one was condescending enough to act as a good model. To be perfectly honest, FH does not have many attractions except for nature lovers, and more than a couple of days stay there may not be appropriate if travelling with a young family as there is little to do there, apart from playing on the oldest golf course in Malaysia, and very few shops except restaurants for tourists. 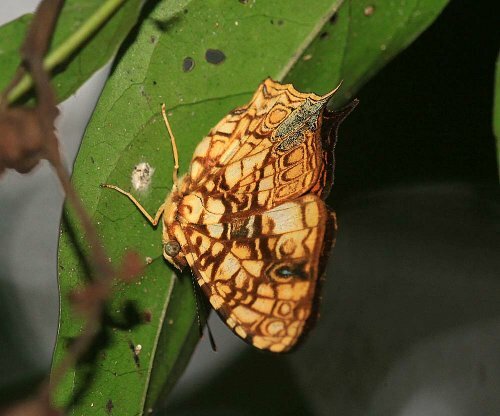 To see all the Malaysian species found during my travels, go to the West Malaysia section of ‘Expeditions’. I spent a week with some friends in May in the area around Manado, which is towards the end of the North-Eastern arm of this wierd shaped Island. Things got off to a bad start when our plane from Singapore to Manado was delayed for 2 1/2 hours. To make matters worse, whilst going through immigration at Manado, I could see my things going round waiting to be collected. When I say my things, I mean my suitcase contents! My suitcase had been ripped in two some time between check-in and arrival. I have still to be recompensed, as I had to buy an emergency ruck-sack to keep everything in. SILK AIR, YOUR CUSTOMER SERVICE IS CRAP!!!!! Now to the better part, we had a seven hour ‘road’ trip to make from the airport to our first location, Bogani Nani Wartabone National Park, and we arrived just after midnight. I will never complain about the roads on Samui again! Our accomodation, just outside the park was described as basic, and it was…..very. However, the charming lady of the house proved to be a wonderful cook, and I had glorious local food there. Our first morning saw us taken to the Park, which, apparently does not get many visitors, the last being at least one month beforehand. 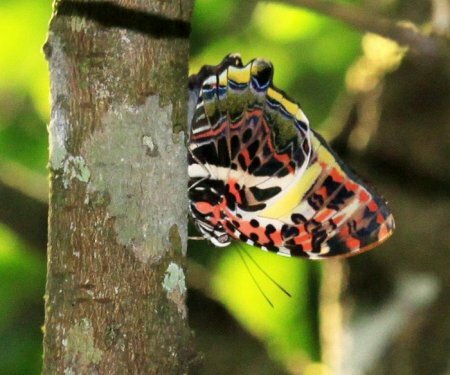 Our arrival gave us our first view of a species which can only be found on Sulawesi (endemic), Papilio gigon gigon . 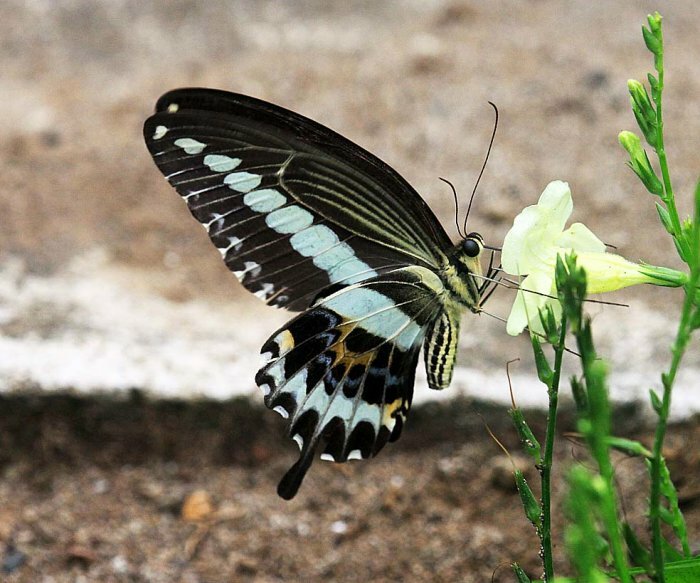 This is part of the demolion group of swallowtails and was quite similar to that found on Samui, but much larger. Our path into the forest involved us taking a very short ferry trip acorss a river. This ferry was made of few bamboo trunks, tied together, with a board on top to kneel down on. Having safely made our way across, we entered the jungle. The path was narrow, and we had to keep to it and follow our park ranger, who really did not know what we were looking for, or how to react when seeing a butterfly, he is more used to leading bird-watching expeditions. 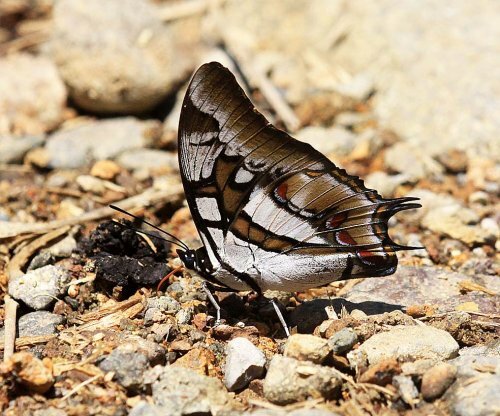 The walk was rather disappointing, in that we did not see as many species as we had expected, but there were still enough new ones, usualy endemic species, for us to photograph. The afternoon was also scheduled to be in the Park, but we asked our guide for the first 1/2 of the trip if he knew of any areas which might have been more profitable for us. After a couple of tries, we finaly arrived at an area, outside the park, that was eminently suitable, with a small stream, open areas and forest all in a small area and we spent a very enjoyable afternoon, and the next morning there. 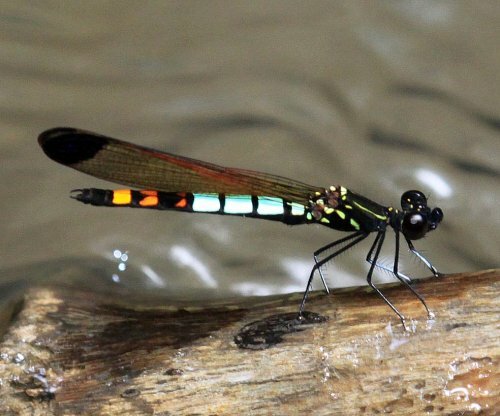 Marcus, our dragonfly fan, in particular, had a great time there, finding many species, most of which we are still having difficulty in identifying. The afternoon was to be spent driving to a non-descript city where we were to stay the night before completing our return to Manado, where we were to change guide and drivers. 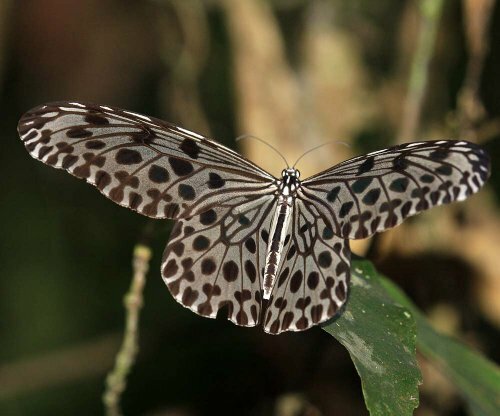 We asked if it would be possible to change the schedule so that we would go all the way to Manado that afternoon and evening, allowing us an extra morning looking for butterflies, suggesting the nearby Kali waterfall. To our guide’s credit, he agreed, and he hastily rearranged our night’s accomodation. The next morning, after a long-awaited, and much-needed hot shower, we set off to Kali. It is not far from the City, and, looking at the websites is considered a tourist attraction. Unfortunately, the local authorities are not maintining this facility, and the walk down to the waterfall is steep and dangerous owing to the slippery path. Owing to this, I decided to stay on a more level area of the path, whilst the others carried on. They confirmed the danger, though admitted that the waterfall is very pretty. 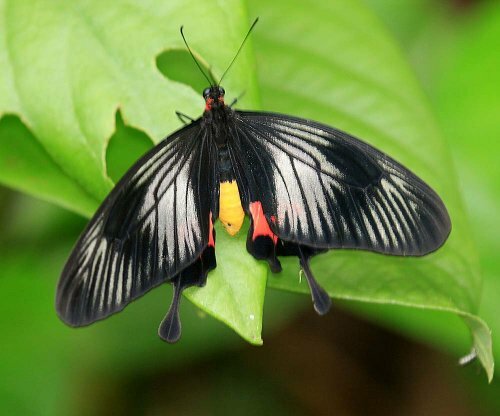 On returning to Manado, we changed our drivers and guide for the remaining visits to Tangkoko Nature Reserve and Minahasa Highlands. At this point I must thank both Roy, our guide and Albert, my driver, who both did their utmost to ensure the first part of our trip was as successful as possible. 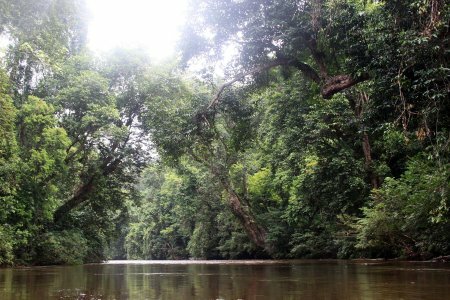 Tangkoko Nature Reserve is an estuarine forest, next to the world famous Lembeh Strait, known for its exceptional diving possibilites. 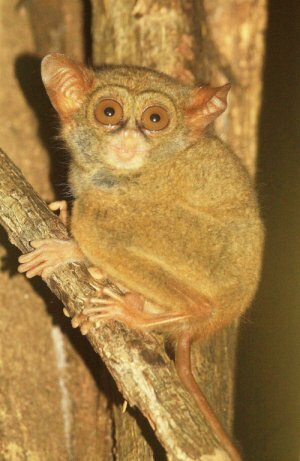 The reserve is most famous for its Spectral Tarsiers, which are endemic to this part of the Island. They are very strictly protected, but dusk visits to their ‘nests’ are available if accompanied by a ranger. They were sooooooo cute! 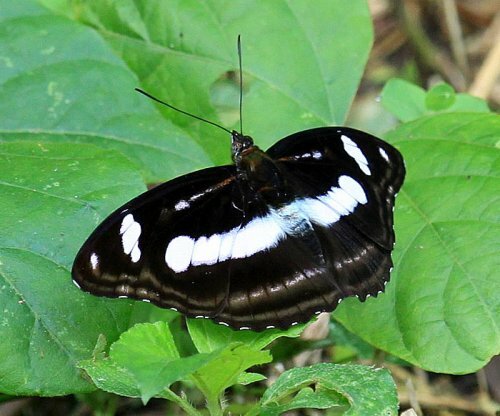 The reserve and our nearby lodge proved to be excellent hunting grounds for us, with many species seen there which we had not come across before. The final part of our trip was to the Minahasa Highlands, which stand at arround 1000km above sea level. We were looking forward to this for two reasons. 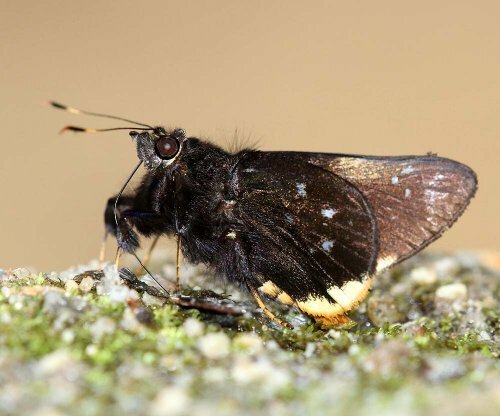 Firstly, we hoped to see some more montane species, and secondly, the Highlands are Volcano territory, and one, Mt. Lokon, had erupted only a couple of weeks before our visit, though it does this on average 10 times a year and is not considered one of the more dangerous ones in the region. It was only about 5km away from the resort where we stayed, but unfortunately, or should it be fortunately, it only spouted small plumes of smoke whilst we were there. 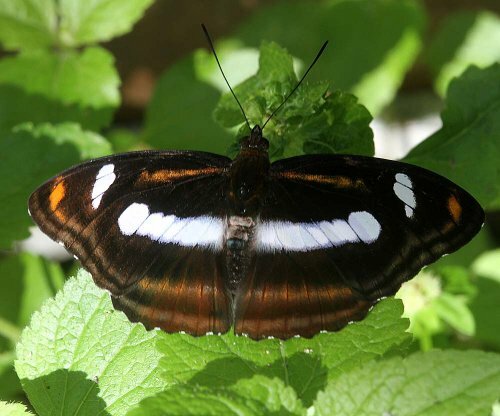 At the resort, the most prominent species visible were 2 Delias species, which I, as a Delias fanatic, was delighted to see. 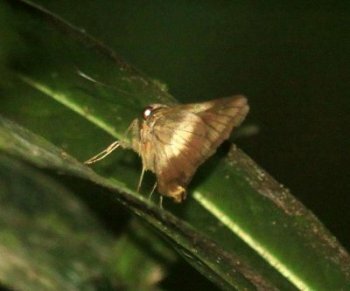 Unfortunately, both species, Delias rosenbergi rosenbergi and D. zebuda, proved to be very difficult to photograph as they never stayed still, only stopping to feed for abour 1 0r 2 seconds, and also they tended to stay up at the tops of the flowering bushes. 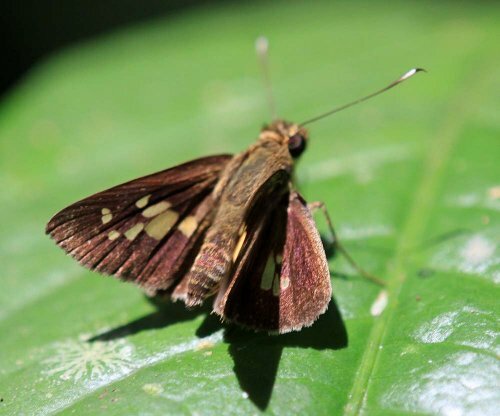 Our guide took us up a mountain where we ,again, saw many species, none of which we had found at lower elevations. Sulawesi has proved itself to be a fascinating island, and despite the various inconveniences we suffered, we will definitely be returning, but perhaps trying the southern arm of the Island. 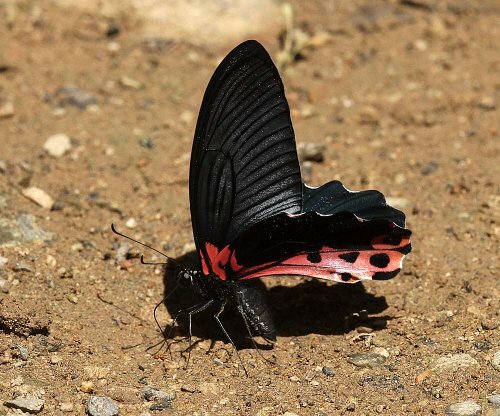 To see all the species I photographed on my trip please visit the ‘Expeditions’ section of the website and click on ‘Sulawesi’. I have just been lucky to visit Khao Sok Nation Park in Surat Thani Province, S. Thailand, with my good friend Antonio Giudici. The entrance to the park is at the end of a short road off the main highway between Phanom and Takuapa, about 5Km before the roadside Mai Yai waterfall, which, incedentally, I do not recommend during the dry season. 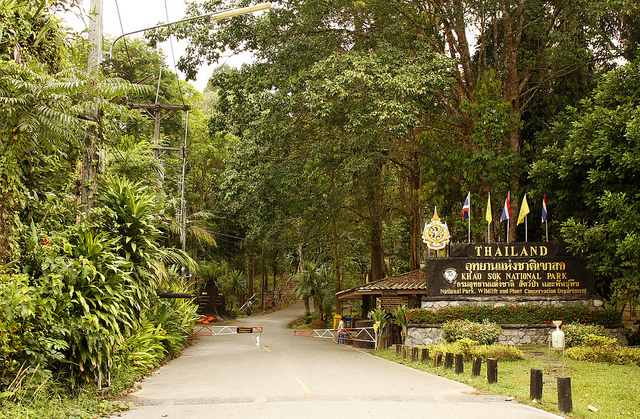 The short road to the park entrance is lined with small resorts for Park visitors, and it is only a short walk to the entrance itself. Entry fees are 100Baht for foreigners. 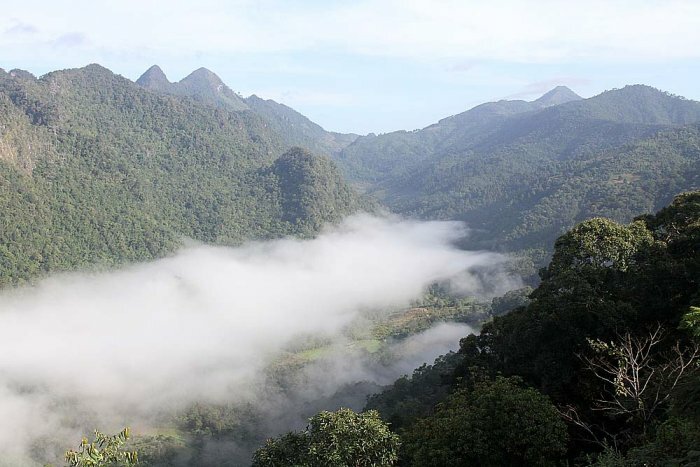 Because Khao Sok is directly connected to 2 other Parks, this is a huge area of undisturbed rainforest, and has almost the full compliment of major mammals, including Elephants, Tigers, Tapirs and Sun Bears. 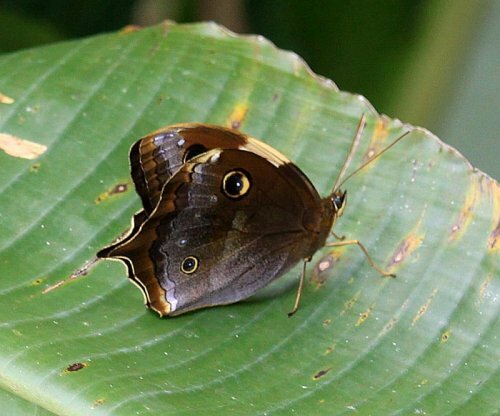 In fact, the only large animal missing is the Sumatran Rhino, though with such a large area remaining unexplored, it is still possible that a few may be hiding deep inside the rainforest, I certainly hope so. The weather was generally good during the day, the morning mist clearing by 10:00 each morning. Clouds started to appear at arround 13:30, with thunder sounding at 14:30. 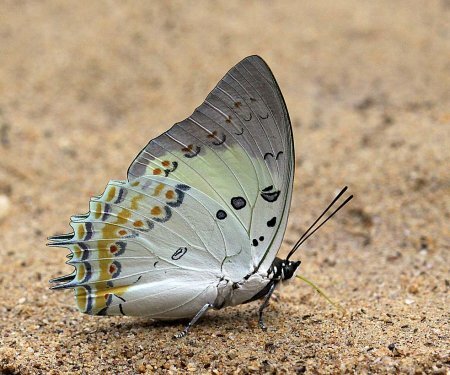 Ususally, it was raining by 15:00 which brought our butterfly hunting to an end. We concentrated on one main path which runs close to the Sok River. The first 3.5KM is an old road, but after that, the path becomes only wide enough for single file walking. 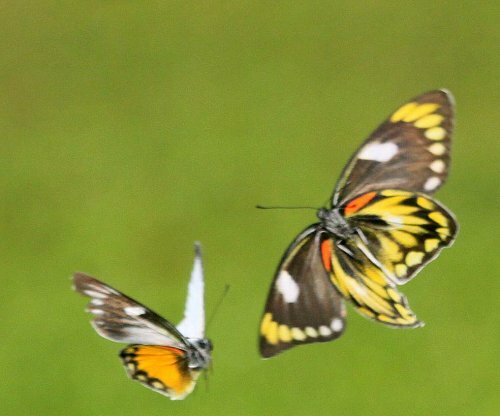 It appears that we were there at the start of the main butterfly season, there not being a huge amount, numbers wise. However, the species we did come across were interesting in the extreme, including some great rarities. On our first day in the park, we almost immediately came a cross a new species for me, the Yellow Tailed Owl (Neorina crishna archaica), which proved to be a very good model, and stayed on the path for a long time. I thoroughly recommend a visit to this wonderful Park. Most resorts have a number of excursions available to residents, including a trip on the dammed lake, which, I understand, is extremely beautiful, whough we never had time to undertake this one. I can assure you, I will be going back, hopefully, later on this year. 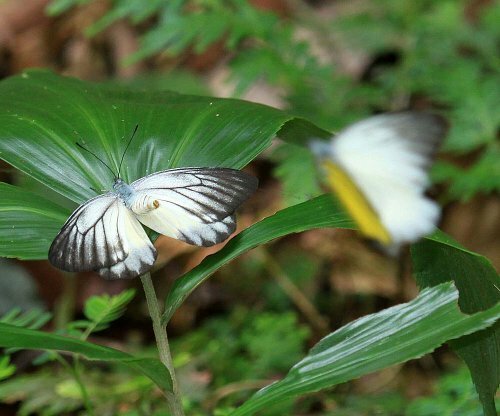 On 26 August 2011, my good friend, L C Goh, from Kuala Lumpur, and I travelled to Taman Negara, in Central West Malaysia. 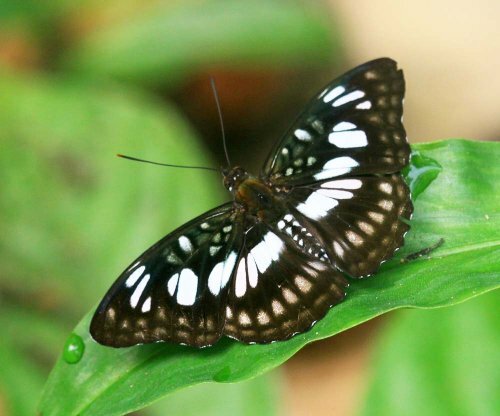 This park was first national park in Malaysia, is the largest and has purportedly, the oldest rainforest in the world. It is, quite correctly, promoted by the Malaysian Government as the flagship park. Unfortunately, for me, this means that it is very busy, and it is very difficult to find places where you will not get interruped by a train of guided tourists on a jungle walk. PLEASE NOTE that this is not a complaint. 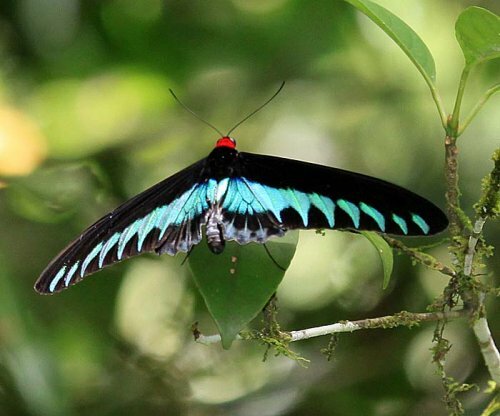 I have been thoroughly spoilt on my previous tropical rainforest experiences. The park is a perfect introduction to this habitat for anyone not used to it, and it is also a safe and great place for a family. 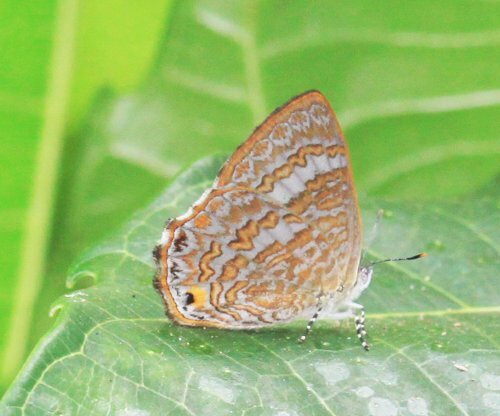 Despite this regular distraction, and the fact that the weather was not entirely kind to us, we were able to find over 120 species, many of which were new to me. 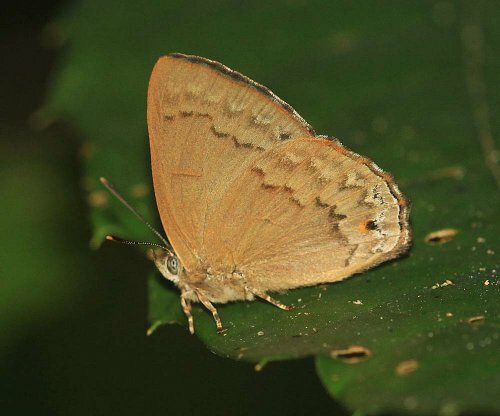 This first species to come to our attention was this female Arhopala, which has since been identified as Arhopala kurzi. 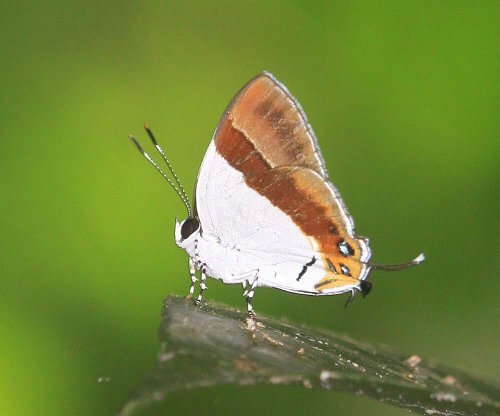 This species was found on the track to Lubok Simpon. This area is where the locals come to have picnics and swim, and it gets very busy from mid-day onwards. 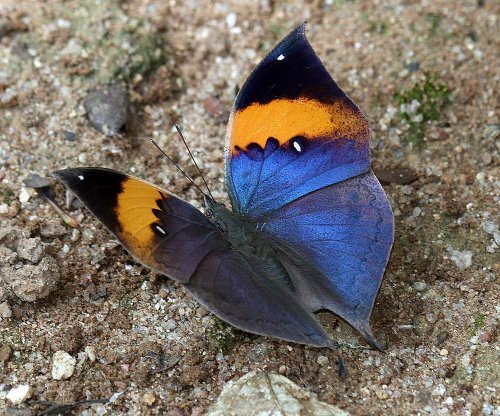 This is a shame, for a butterfly photographer at least, as it would be the perfect place to find puddling species. 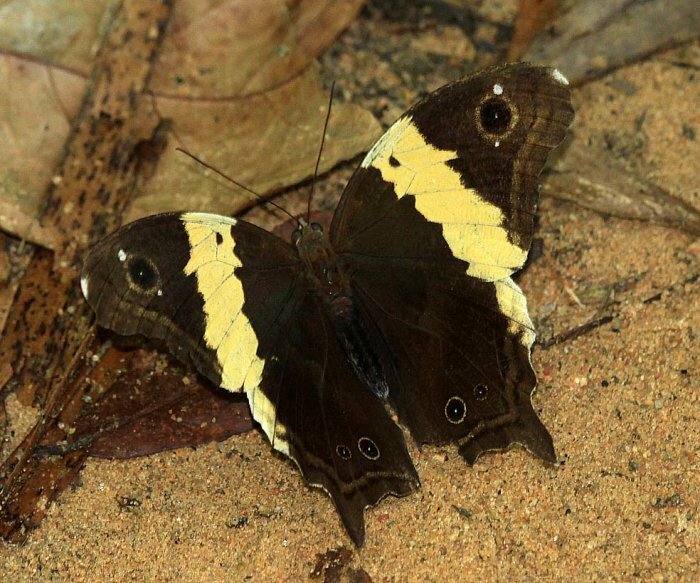 The only species of worth that we came across there was this Polyura delphis concha, a beautiful large species, which although not considered rare, was a new species for me. 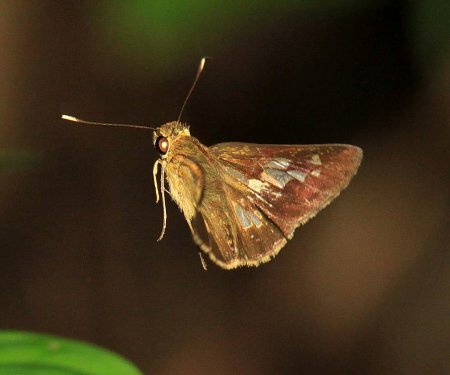 By far, the most interesting species were to be found in the dense forest. This meant an interesting walk, not always as easy as I would like. There are short stretches where you need to climb, or lower yourself down on ropes as the track can be very steep and, if it has rained, slippery. 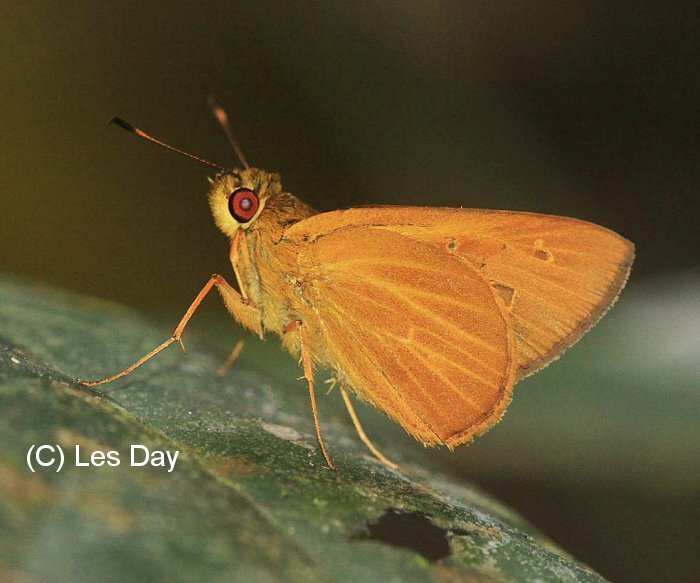 The effort is worth it, and below, are some of the rarer species we found. 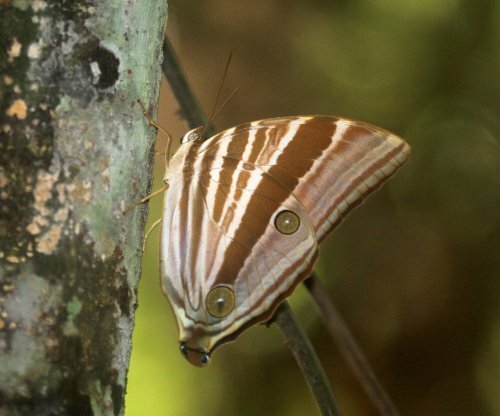 By far the most unexpected find was the very rare Chestnut Rajah (Charaxes durnfordi durnfordi). 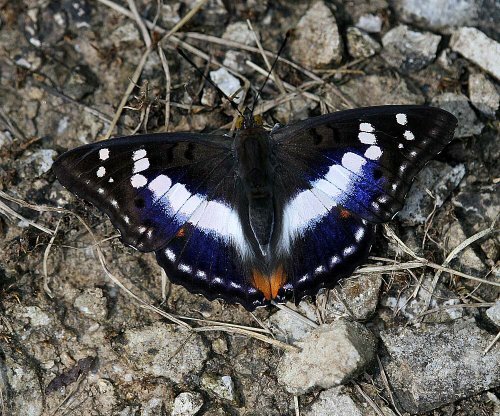 This is a much prized species in collections, and certainly took our breath away as it flew around us, attracted to our sweat rucksacks and camera. Swimming area! Not today, after rains. 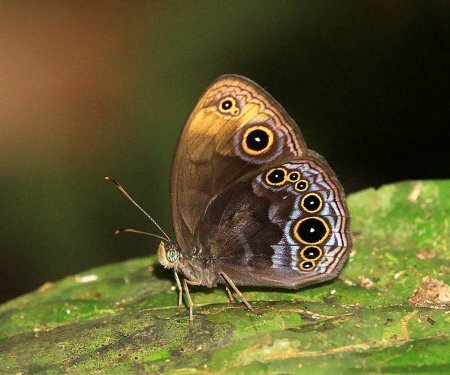 Many people think that rainforests are teeming with animals for them to see. This is not the case. Yes, they are there, but, very wisely, most of them try to keep a distance between themselves and us. 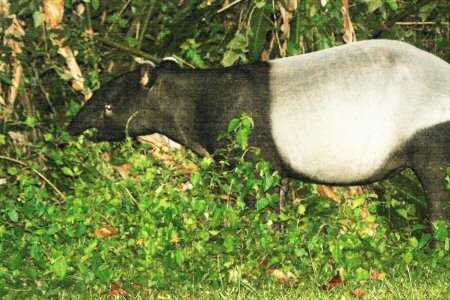 However, we were very lucky to have a visitor to our chalet, an endagered Malay Tapir. This is not a good photo, as it was dark, and my camera seemed to object. 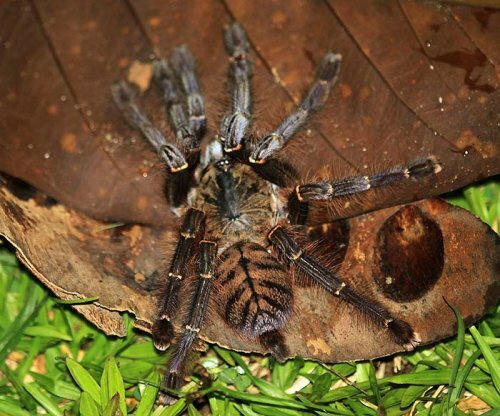 Hopefully you can get a good idea of what the species is like from this. I know LC got much better photos (he is a much better photographer than I am). On the way back to KL, we stopped at an interesting looking spot around Genting. It did not disappoint. 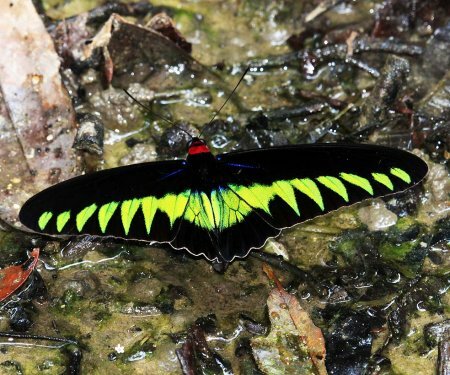 It is always a delight to see Malaysia’s national butterfly, the Rajah Brooke’s Birdwing (Trogonoptera brookiana), but more than this, I was able to rectify an ommission from my previous trip to Maliau Basin, when a couple of the group managed to photograph the Glorious Begum (Agatasa calydonia calydonia). It was a great surprise to find it here, and an opportunity I was not going to miss this time.